"This is the final verdict. My fight is over." "My doctors tell me their best estimate is that I have only a few weeks left to live," he wrote. "I leave this life with no regrets," he wrote in the farewell message. "It was a wonderful life -- full and complete with the great loves and great endeavors that make it worth living. I am sad to leave, but I leave with the knowledge that I lived the life that I intended." He had to step away from both jobs last August for surgery to remove what he called a "a cancerous tumor in my abdomen." "Special Report" anchor Bret Baier occasionally gave updates to viewers about Krauthammer's recovery. "Colleagues and viewers alike had held out hope that he would return to the evening show he helped establish as must-viewing," Fox's story on Krauthammer noted on Friday. Last month Baier offered some good news via a message from Krauthammer: "The worst now appears to be behind me." "Recent tests have revealed that the cancer has returned," he explained Friday. "There was no sign of it as recently as a month ago, which means it is aggressive and spreading rapidly." In his note to readers, he thanked colleagues, readers, and viewers "who have made my career possible and given consequence to my life's work." He wrote: "I believe that the pursuit of truth and right ideas through honest debate and rigorous argument is a noble undertaking. I am grateful to have played a small role in the conversations that have helped guide this extraordinary nation's destiny." Rupert Murdoch, the executive chairman of Fox News, said in a statement Friday afternoon, "Charles has been a profound source of personal and intellectual inspiration for all of us at Fox News. 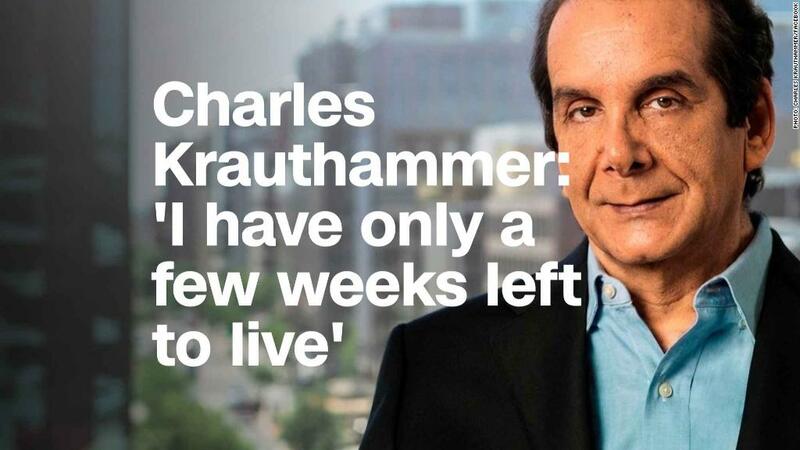 His always principled stand on the most important issues of our time has been a guiding star in an often turbulent world, a world that has too many superficial thinkers vulnerable to the ebb and flow of fashion, and a world that, unfortunately, has only one Charles Krauthammer. His words, his ideas, his dignity and his integrity will resonate within our society and within me for many, many years to come." Vice President MIke Pence also weighed in with a tribute, tweeting, "Karen and I were saddened to learn that Charles ⁦‪@krauthammer‬⁩, a man we greatly admire, is nearing the end of his extraordinary life. His wit, his wisdom, and his tireless defense of Western values have made an indelible mark on the minds of millions of Americans."